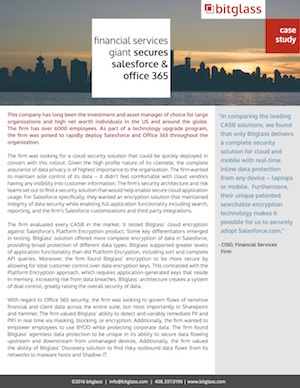 Find out how a large financial servcies company evaluated every major CASB vendor and chose Bitglass for comprehensive data & threat protection across Salesforce and secure Office 365. Click the download button to read the case study. “In comparing the leading CASB solutions, we found that only Bitglass delivers a complete security solution for cloud and mobile with real-time inline data protection from any device – laptops or mobile. Furthermore, their unique patented searchable encryption technology makes it possible for us to securely adopt Salesforce.com."